Two late goals from Jermaine Beckford secured an extra-time victory for Championship side Bolton in the Capital One Cup against League One Crewe. The striker looked to have won the tie in the first minute of stoppage time, but Marcus Haber scored an even later goal for Crewe to force extra-time. Beckford, 30, then flicked the ball under goalkeeper Ben Garratt in the 106th-minute to secure victory. 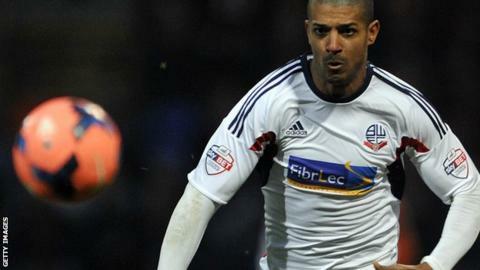 Bolton's Darren Pratley cancelled out Brad Inman's opener in the first half. The Trotters are yet to win the the Championship this season and made nine changes from Saturday's 2-1 defeat at Brighton. They travel to Chelsea in the third round. Bolton boss Dougie Freedman: "All credit to Crewe for making it a very interesting tie, but I thought we were superior in extra-time. I'm happy to go through and I am pleased for one or two of the youngsters I drafted in. "Thanks to our energy and commitment we worked our way back into what was a very difficult game. We were right on top in the second half and created a number of chances." Crewe boss Steve Davis: "I thought we were excellent although it didn't go for us in the end. We showed great spirit when we went 2-1 down. We had a lot of opportunities. "When you don't win games your confidence can drain a bit, but if we play like that in the league we will win more games than we lose." Match ends, Crewe Alexandra 2, Bolton Wanderers 3. Second Half Extra Time ends, Crewe Alexandra 2, Bolton Wanderers 3. Lee Chung-Yong (Bolton Wanderers) wins a free kick in the defensive half. Attempt blocked. Billy Waters (Crewe Alexandra) right footed shot from the centre of the box is blocked. Corner, Bolton Wanderers. Conceded by Matt Tootle. Attempt saved. Jermaine Beckford (Bolton Wanderers) right footed shot from the left side of the box is saved in the bottom right corner. Foul by Matt Tootle (Crewe Alexandra). Matt Tootle (Crewe Alexandra) wins a free kick in the defensive half. Goal! Crewe Alexandra 2, Bolton Wanderers 3. Jermaine Beckford (Bolton Wanderers) right footed shot from the centre of the box to the bottom right corner. Assisted by Lee Chung-Yong. Second Half Extra Time begins Crewe Alexandra 2, Bolton Wanderers 2. First Half Extra Time ends, Crewe Alexandra 2, Bolton Wanderers 2. Attempt missed. Billy Waters (Crewe Alexandra) right footed shot from outside the box is close, but misses to the right. Attempt missed. Billy Waters (Crewe Alexandra) left footed shot from outside the box is close, but misses to the right. Corner, Bolton Wanderers. Conceded by Greg Leigh. Attempt missed. Joe Mason (Bolton Wanderers) header from the centre of the box is just a bit too high. Corner, Crewe Alexandra. Conceded by Tim Ream. Corner, Crewe Alexandra. Conceded by Andy Lonergan. Marcus Haber (Crewe Alexandra) hits the left post with a right footed shot from the centre of the box. Hand ball by Lee Chung-Yong (Bolton Wanderers). Corner, Bolton Wanderers. Conceded by Adam Dugdale. First Half Extra Time begins Crewe Alexandra 2, Bolton Wanderers 2. Second Half ends, Crewe Alexandra 2, Bolton Wanderers 2. George Cooper (Crewe Alexandra) wins a free kick in the attacking half. Goal! Crewe Alexandra 2, Bolton Wanderers 2. Marcus Haber (Crewe Alexandra) header from the right side of the six yard box to the top right corner. Assisted by Bradden Inman. Attempt missed. Anthony Grant (Crewe Alexandra) right footed shot from outside the box is close, but misses the top left corner. Hand ball by Anthony Grant (Crewe Alexandra). Goal! Crewe Alexandra 1, Bolton Wanderers 2. Jermaine Beckford (Bolton Wanderers) right footed shot from the centre of the box to the top left corner. Matt Tootle (Crewe Alexandra) wins a free kick on the left wing.